The waterways of Galway are of great engineering significance. Major engineering works were required to construct the waterways and they were a major influence on the location of the first industries in Galway. The natural drainage channels from Lough Corrib to Galway Bay included the River Corrib, the Gaol River or Cathedral River and the Western River or Convent River. By the mid 19th century there were approximately 30 mills in operation in Galway. There were two major engineering projects, which resulted in the waterways system which exists today. The Loughs Corrib, Mask, and Carra Drainage and Navigation Scheme was constructed between 1848 and 1858 and the Corrib-Clare Catchment Drainage Scheme was constructed in the 1950s. The Corrib and canal systems have over the years provided a number of benefits: navigation, water power, drainage for the Corrib catchment, fisheries and as a source for water supply to Galway city and surrounding areas. The works were based on proposals in the McMahon Report of 1846 with some amendments. It was an integrated scheme in that while the primary purpose was to improve drainage (reduce winter water levels and the areas of flooded land) and navigation in the respective catchments this was to be undertaken without detrimental effect on the mills or fishery interests. The winter flood level was reduced by 450mm (18") and the tailraces from the various mills were deepened such that the water head was not impaired. Construction of a deep tailrace from the Newcastle mills to the marble factory to discharge to the river Corrib to rear of the Old Hygeia Building. These works were designed by Commissioner Mulvany and insured that three mill sites could be retained. Excavation of the River Corrib channel from the head of the Eglinton Canal to approximately midway between the William O'Brien and Wolf Tone Bridges. Construction of a new weir just north of the old weir. The Eglinton Canal provided two main functions, firstly as a navigation channel from the Claddagh Basin to Lough Corrib and secondly as a feeder channel to the Gaol River and Western River and the various mills they powered. Swivel bridges, constructed from a wrought iron frame and timber decking, were erected at five road crossings. The canal was used for transport of goods by boat until the early part of the 20th century. Tolls of £370 were collected in 1880 but this had reduced to £35 in 1905 and £1 in 1916. The last boat to use the canal was the Guinness 90 foot yacht, OAmo II, in 1954. By this stage the swivel bridges were in a poor state and it was decided to replace the bridges with fixed bridges. The William O'Brien Bridge was the first bridge across the Corrib and was originally a wooden bridge, called the West Bridge. The current bridge was rebuilt in 1851 as part of the Corrib Mask Drainage Scheme. The other bridges are the Salmon Weir Bridge (1818), the Wolf Tone Bridge (constructed in the 1850's as a pedestrian bridge and rebuilt in 1877 and 1935) and the Quincentennial Bridge (1985). The Galway Electric Light Company, run by the Perry family, converted the mills at the current ESB premises at Newtownsmith to a hydropower station in 1888. This operated until 1929, on completion of the Ardnacrusha Scheme, when the ESB acquired the premises. 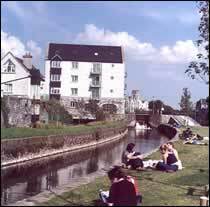 The Hydrology Department of NUIG prepared the Report on Hydropower Potential of the Galway City Canals for ESB in 1985. It considered that the primary sites for hydropower were Hunters channel and the Eglinton Canal at Parkavera with potential of approximately 1.5MW. However, achieving this potential would have implications for other uses of the Galway Waterways, boating, fishing and would also result in a decrease in the flow in the main channel of the River Corrib. The only operating hydropower installation on the waterways of Galway, resides in NUI, Galway¹s McLaughlin Building, Nun's Island. This building houses two turbines: a restored 1932 Francis turbine and a turbine manufactured entirely from plastic. 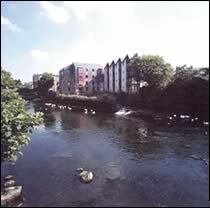 In 1980, the then University College Galway purchased a flour mill, situated on Gaol River at Nun¹s Island. During reconstruction of the building, the sections of a Francis turbine were discovered. Robert Craig & Sons, Belfast originally manufactured this 42 kW turbine in 1932 and refurbished the turbine in 1981. The second turbine in the McLaughlin Building was installed in the mid 1980s. It is a Francis turbine manufactured entirely from plastic. It operates on a head of 2 metres and a discharge of 2.6 cubic metres per second. It has a power output of 32 kW.